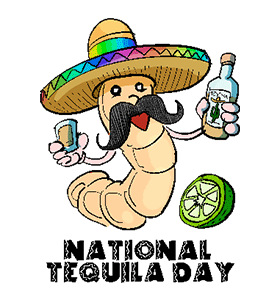 ﻿National Tequila Day: Calendar, History, Tweets, Facts, Quotes & Activities. National Tequila Day is dedicated to recognizing Tequila, a distilled alcoholic beverage made from the blue agave plant and the main alcohol in a margarita. Blue agave plants produce sugars such as fructose, which are ideal for preparing tequila. The plant only grows in the rich and sandy soil of Jalisco, Mexico at altitudes of 1,500 meters. To make tequila, the heart or piña of the plant is removed when the plant is approximately 12 years old, and weighs around 40-90kg. The heart is then heated to extract sap which is fermented and distilled into tequila. According to history, the Aztecs created fermented beverages from the agave plant prior to arrival of Spaniards in 1521. The origins of National Tequila Day are not well understood, however, it appears that National Tequila Day began to emerge around the late 1990s. This holiday is celebrated every year on July 24. During prohibition, tequila became more popular because smuggling liquor into the country was easiest from Mexico. According to Guinness World Records, the most expensive bottle of tequila was worth $225,000 in 2006. The Platinum & White Gold Tequila bottle was sold by Tequila Ley .925 to a private collector. The tequila was harvested from 100% blue agave plants that had been aged 6 years. As per the Official Mexican Standard for Tequila (NOM-006-SCFI-2005), the alcohol content of tequila ranges from 35-55%. As per the Consejo Regulador del Tequila (Tequila Regulatory Council), Mexico produced 118.9 million liters of 100% pure agave tequila, of which 77.9 million liters were exported. Try the World's Best Tequila. Winner of the World's Best Tequila Award 2015, 1800 Anejo is produced by La Rojena. Tour tequila distilleries along the tequila trail in Jalisco, Mexico. The distilleries offer insight into the production process and offer ample opportunity to sample a variety of tequilas. 1) Citrus and tequila infused cupcakes. Add some citrus zest and sprinkles of tequila to the cupcake frosting. 2) Tequila glazed chicken. Just add a few spoons of tequila to your favorite chicken glaze recipe. 3) Barbecued tequila and lime pork spareribs. Add lime and tequila to an overnight sparerib marinade.